The Georgia DOT is reconfiguring left tur movement at the intersection of SR 124 and U.S. 78/SR 10 in Snellville to the reduce the potential for angle-type crashes. Downtown Snellville in Gwinnett County is undergoing a major road infrastructure upgrade to improve traffic flow under a $13.5 million Georgia Department of Transportation (GDOT) project. Plans call for the installation of a continuous-flow intersection (CFI), also known as a displaced left turn, which will remove the left turns from the main intersection of SR 124 and U.S. 78/SR 10 at Henry Clower Boulevard. "This is quickly changing the way people drive through our district," said Dana Garrison, GDOT's project manager, Northeast Region. "In 2003, the Snellville Town Center Livable Initiative identified the need for improvements at the intersection and labeled it as the source of great congestion within the city. The crash and injury rates for 2006 to 2008 exceeded the statewide average for similar facilities. "Furthermore, the intersection operated at an unacceptable level of service of E/F for the 2012 year with a travel delay of 62 to 126 seconds per vehicle in the a.m./p.m. peak times," she added. "The CFI intersection was chosen to be constructed in coordination with the public via the citizen advisory committee and the public information open house." The contract was awarded to Pittman Construction Company Inc. (PCC) in August 2016 and construction began in November 2017. The job also entails the installation of new traffic signal bridge and the approaches to it at the intersection, as well as the creation of an efficient bypass for the CFI. The scheduled completion date is Aug. 31, 2019. State and federal funds are covering the cost of the project. The final design was presented in October 2016 at a public meeting that brought together the results of past surveys and studies via various stakeholders, which included focuses on traffic and congestion, road safety, and design concepts. This CFI intersection is the second to be installed in Georgia. The concept is based on taking current signalized intersections and altering them to permit motorists to make left turns prior to the convergence of two major roads. "Georgia DOT reports that relocating the left-turn movement from the center of the intersection to the side reduces the potential for angle-type crashes . . . as well as reducing the frequency and severity of crashes," said GDOT District Engineer Brent Cook. Cook added that the CFI, in addition to reducing congestion, will save taxpayer dollars by avoiding the need to construct a traditional interchange structure. The design for the Snellville CFI was produced by Gresham Smith and Partners. Construction in a downtown core always has a major impact on traffic. 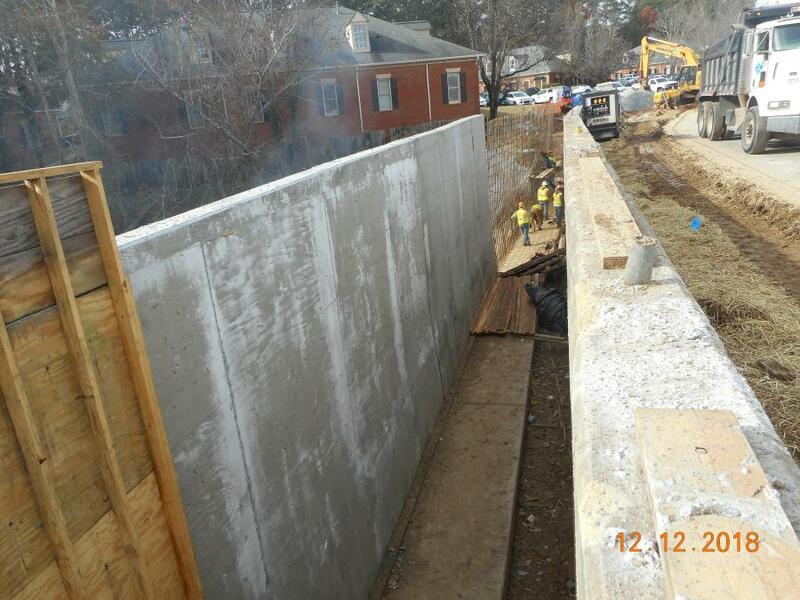 Pedestrians and motorists are being urged by GDOT to be cautious when passing through the construction zone to avoid accidents and to give crews the opportunity to complete the work as quickly and safely as possible. Pittman Construction crews are meeting objectives. 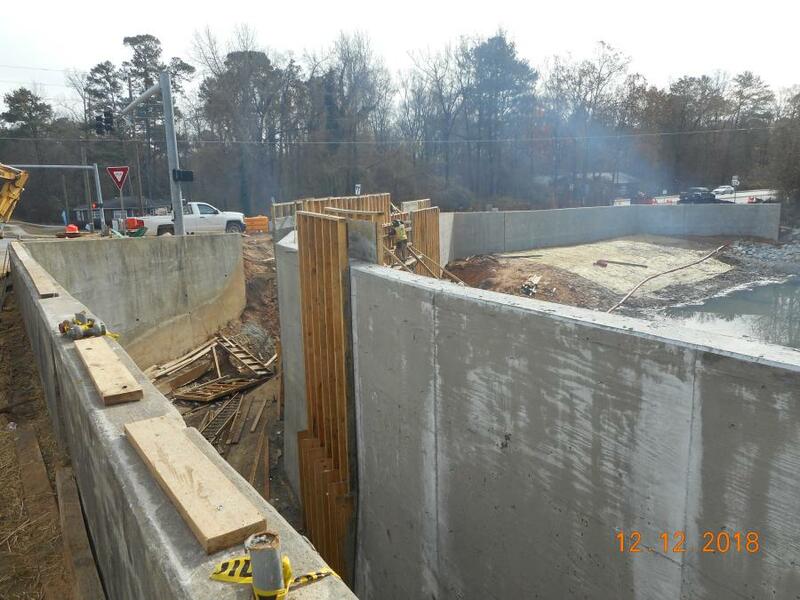 "We're in Stage 2 of the construction," said Dana Garrison, GDOT's project manager. "We're basically putting down the graded aggregate base [GAB], getting ready for the crews to come to put down the asphalt and build the wall to put the road in and hold the dirt." It all began with the earthwork and site preparation, starting with clearing operations and grading. "We then put in the subgrade and the GAB," said Garrison, who took over the project in April. "We'll be going into another phase where we have to put in some temporary signals and shift traffic over to where we can complete the locations for the other lanes. We haven't got all the lanes cut out because we're still waiting on utilities to move. 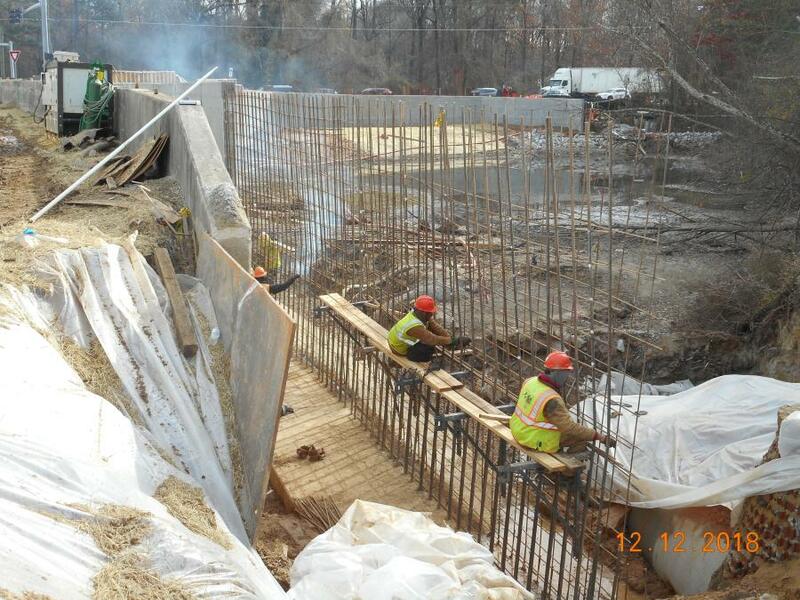 Where we didn't have any obstructions, we integrated the GAB to the subgrade split." Utilities being relocated include Atlanta Gas, Comcast, AT&T and Walton EMC. Water lines are being installed for Gwinnett County. The utilities are cooperating with GDOT. "They knew that we had preliminary hearings when this job was in the concept phase and plans were sent out to the utilities, and to let us know if anything was in conflict. There is also a lot of coordination between GDOT, Snellville, and Gwinnett County," Garrison said. Asphalt operations are expected to start in early spring. "We may do a little bit of paving this winter," said Garrison, "but that will be dictated by the temperature, and usually that has to be around 45 F and rising." The main section of road to be paved is approximately 0.9 mi., with eight lanes, in addition to smaller sections of for a couple of hundred feet. Night paving operations will be conducted as sections are completed and traffic is shifted. "Crews are working on either side of the road," said Garrison. "There's between 30,000 and 35,000 cars a day coming through and concrete barrier wall has been put up, but we're far enough off of the mainline that our work is not impeding traffic — there are small lane closures here and there." Paving operations will be conducted throughout the day, with specific areas done at night due to lower traffic levels. 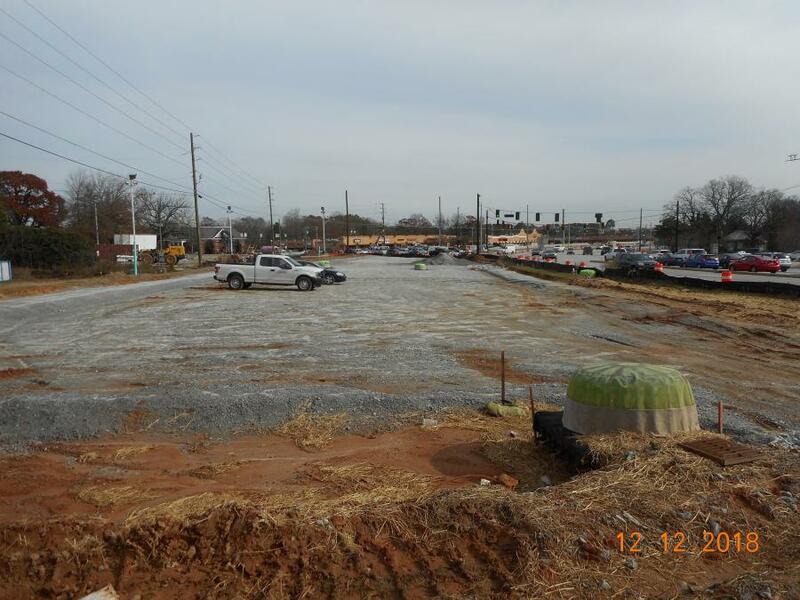 The work site is tight, and the contract included GDOT setting up a storage yard next to the field office that is shared by GDOT and Pittman personnel. Pittman's superintendent for the project is Robert Moon, who is responsible for the scheduling of the work and meetings with utilities. Deliveries of materials are done on "as needed" basis, based on materials in the yard being installed rapidly, such as pipes for the water lines. Garrison has been with GDOT for 30 years and has been involved with a wide variety of projects. "The biggest lessons learned are for schedules and working hand in hand with the contractor to resolve issues as quickly as possible to be efficient and cost-effective, and to protect the interest of the people and safety of the travelling public," he said. "Robert and I are working together daily." Save for a few isolated Saturdays, crews — between eight to 10 members —are working 7 a.m. to 5 p.m. Mondays to Fridays. The subcontractors include many local firms. The amounts of materials being removed are still being tabulated, but Pittman is recycling concrete and asphalt for other projects and corrugated metal pipe is being placed in a bin set-up by a recycling firm. Figures for the new materials are also being tabulated. In addition to having excavators, dozers, loaders, rollers, and pavers, Pittman is using a crane to help set the walls, which will also be used to install the traffic signal bridge and other elements of the work.